These unicorn rock painting ideas will have you making painted stones in magical styles. Get the tutorials and inspiration for your own unicorn rock! 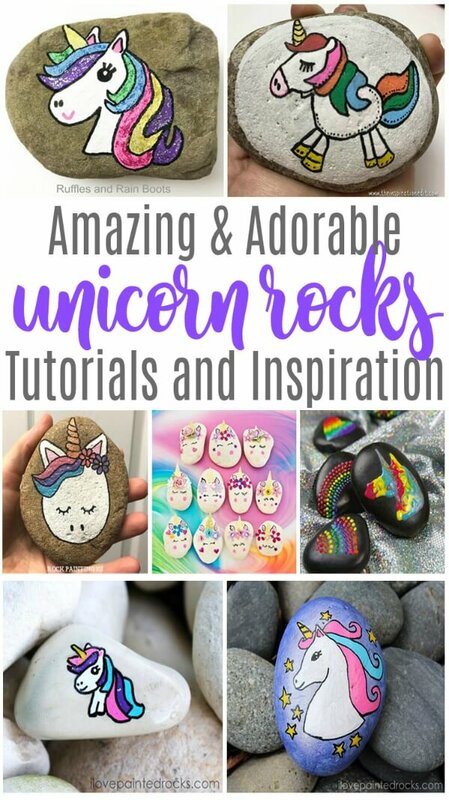 Magical DIY Unicorn Rocks – Hello Wonderful – From one of my favorite sites on the Internet, these DIY unicorn rocks are just amazing. I love the texture (note: you wouldn’t want to hide these outside because of the embellishments). 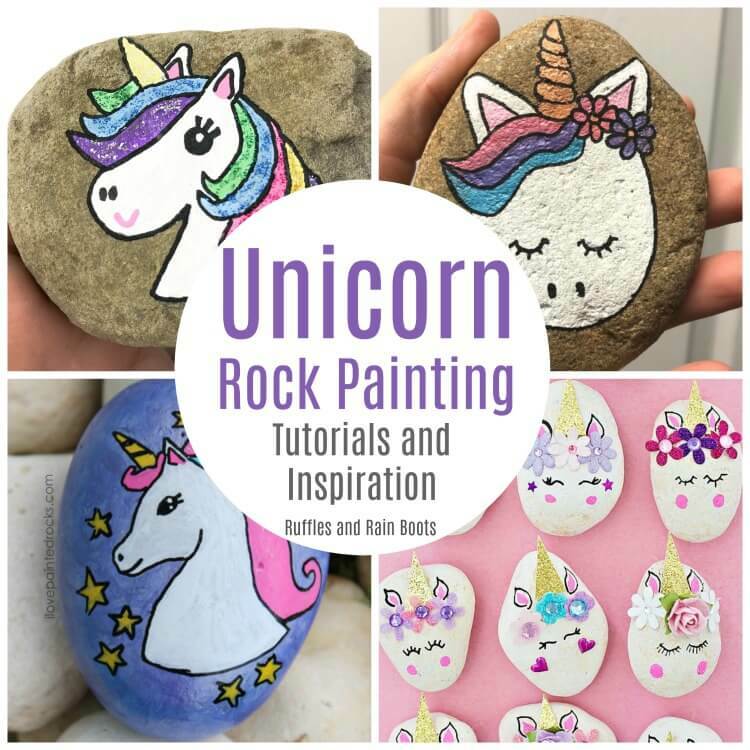 Glitter Painted Unicorn Rocks – Ruffles and Rain Boots – Yes, our popular rock painting tutorial made this list (of course it did). I think it’s popular because it’s one of the easiest unicorn rock painting ideas out there. Purple Painted Unicorn Rocks – I Love Painted Rocks – I’m impressed with the color shift paint she uses. I can’t wait to pick some up! 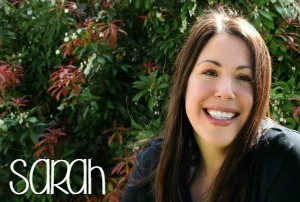 Unicorn Painted Rock – Rock Painting 101 – The creative minds behind the popular Rock Painting 101 site are my friends. I feel so honored to know them and their unicorn rock is just the cutest! Painted Unicorn Rock Stones – The Inspiration Edit – Isn’t this unicorn rock painting idea just the sweetest? Love the stitching. Magical Unicorn Painted Rock – I Love Painted Rocks – A tiny unicorn for a tiny rock. My daughter draws her unicorns like this. Puffy Paint Unicorn Painted Rocks – I Love to Create – Whoa, the color here is smile-inducing. The bright, puffy paint combined with unicorns just makes my heart happy and one of the most colorful unicorn rock painting ideas I’ve seen. There aren’t any tutorials for these amazing unicorn rocks, but some you can definitely figure out. I just love, love, love the creativity with these painted stones. Purple Painted Unicorn Rock – @twobucksandadoerocks – The emo version of a unicorn rock painting. Love it – it’s so moody. Hand Painted White Unicorn Stone – Ginger Rock Shop – Sometimes, simple unicorn rock painting ideas are best. This one is adorable. Whimsical Unicorn Rock – Robyn Paints Rocks – I love the way the hair is painted. Those dark accents will really make it stand out. Pastel and Gold Rainbow Unicorn Rock – Frankies Rocks n Dots – This is one of my favorite unicorn rock painting ideas because, well… GOLD! Doe Eyed Unicorn Painted Rock – @twobucksandadoerocks – The eyes! Aren’t they the cutest? Floral Unicorn Horn Painted Rock – Hand Painted Andrea – This is a very original idea – the color selection makes me think about what I could do with the black and gold. What is your favorite? Honestly, right now I want to make ALL of these amazing unicorn rock painting ideas.